What if you could maximize your yield on every acre? What if you could make more money? What if you could get feedback on your farming practices? What if you had the best information possible to make your decisions on your farm and get all this information from your phone anytime, anywhere? AgraCity’s one of a kind Digital Agronomy Solution, including our advanced machine learning platform, puts us generations ahead of the competition. Partnered with the highly specialized Israel based company, Taranis, our platform allows farm customers and agronomists to monitor their acres any time, any place at the leaf-level through high-resolution sub mm in-scale imagery. This unparalleled scale of imagery enables deep learning analysis of crop issues and better decision making at the farm gate. Monitor your acres like a pro through the Taranis app on your tablet or smartphone from the comfort of your home, the lake, or where ever you are! With support from our team of Precision Agronomy professionals, our platform allows you to view and compare satellite imagery throughout the season, build VR maps, view geographic trends in disease, pests and environmental pressure to make in season decisions, pinpoint areas of interest before entering the field or view leaf level imagery. This next generation of Digital Agronomy is exclusive to AgraCity! Satellite imagery of 3-30 metres resolution is available throughout the season with Landsat, Sentinel and Planet Labs constellations. Look at your fields anytime, from anywhere. Keep up to date on current development of your fields or compare images from previous years or other crops to find opportunities in all your fields. Compare images side by side, either comparing various satellites or the same constellations on different days to see how the crop has evolved. Pinpoint areas that need further investigation or measure field info accurately throughout the season, not just at harvest! Do you like the idea of using Variable Rate (VR) technology on your farm but also want to give your input on the creation of the prescription? Our one of a kind platform allows you to do just that. Overlap and combine as many layers of data as you want- whether its satellite or UHR images, zone maps, soil sampling data or yield maps. Choose the number of zones and set the seed, fertilizer, or spray rates at the levels that are right for your acres- all in just seconds from your computer, tablet, or smart phone. Not comfortable building prescriptions on your own? Our team of agronomic professionals are here to assist you in making the best actionable decisions for your farm! Whole field, multispectral imagery with 5, 8, or 12 cm resolutions available to identify field zones in need of attention at the plant level. Get detailed information on the economic impact of your farming practices or use these images to assist you and our agronomic professionals formulate scouting plans, prescriptions and more! Welcome to the next generation of Digital Agronomy! Our drones, equipped with our advanced camera pods, allows for sub-millimeter imagery to be taken across every acre of the field at any point in the growing season. This replaces the need for managing people, equipment, and physical field notes generated by traditional scouting from only a small fraction of the field. Our platform offers amazing speed and scale at up to 1,000 acres per hour by drone providing one geo-tagged, high resolution image per acre! 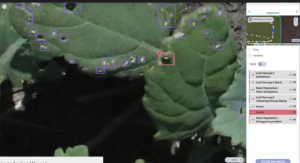 Each image is then uploaded and analyzed by our deep learning engine that acts as the agronomist to identify crop pests, growth concerns and assess plant health and quality. Our algorithm allows you to spend your time only looking at the areas you need to pay attention to. No more walking for days not to find an issue or missing it because the crop is too dense. And the best part-all of this can be monitored from your smartphone or tablet. Scout your fields better than humanly possible! This un-paralleled technology enables detailed agronomy insights and deep learning that provide information about where the problem is, offer the diagnosis of the issue, and with support from our agronomic professionals reveal collaborative treatment plans. Have you ever considered how many of your pulse acres really need a desiccation product such as Clone (same active as Reglone®) to be dried down at harvest? What if you could avoid spraying the 30-70% of your field that doesn’t require product and save BIG on spray costs? AgraCity has the answer with a VR desiccation prescription using our Disruptive Digital Agronomy technology! Using our platform, create the prescription yourself in seconds or ask our team of agronomists to create field by field maps for you. Understanding your soil and fertility needs is the benchmark to achieving the best yields possible on your farm. Our team of agronomic professionals are here to assist you in maximizing your crop yields and farm efficiencies. At AgraCity, we believe that an agronomy consulting program should be tailored to exactly what the farmer wants and needs, not a one size fits all package. Our Disruptive Digital Agronomy Solution allows for just that- grower choice. Get exactly what YOU want and don’t pay for anything more! With numerous package options available, our agronomic professionals look forward to working with you to reach your agronomic goals. Our unique platform does not replace agronomists. Instead, we view this incredible tool as a way of providing agronomists with more in-depth field data to bring further value to the farm customers they work closely with everyday. Whether its access to our patented machine-learning platform to decrease scouting power and cover more acres, more precisely in far less time or satellite imagery to build VR prescriptions for your farm customers, AgraCity is here to be your partner! Whether you are a large farm or an agronomist, if you want this technology in your hands, we can make it happen! AgraCity’s Drone Lease Package allows you to fly and monitor your acres whenever you want! Limited availability for 2019 – so don’t wait to get yours and miss out! Country Wide Roll-Out for Spring 2019! We are launching our Disruptive Digital Agronomy Solution country wide for the 2019 growing season! For more information, call AgraCity at 1-833-376-6324.